Luke Rowe has agreed a three-year contract extension with Team Sky. The Briton, 25, who joined Sky in 2012, has enjoyed his most successful season to date, finishing eighth in the one-day Paris-Roubaix race. Rowe also became the third Welshman to compete in the Tour de France after Geraint Thomas and Colin Lewis. 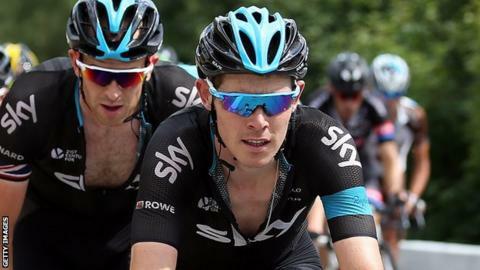 His current deal expires at the end of 2015 and Team Sky principal Sir Dave Brailsford said: "We're pretty close to finalising and I'm sure we'll sort it." In an interview with Sport Wales, Brailsford added: "He's developing well, rode the Tour for the first time this year and did fantastically well." Rowe is seen as a future road captain and Brailsford said: "He's really well liked, he's a bubbly character, he's noisy and he has a laugh - but he's very, very serious when he needs to be and a highly valuable member of the team."